Left to my own devices, I’d go out to eat very rarely. I’m frugal by nature, and I have a hard time justifying the hit to my bank account when I can make my own meals for so much less money. I want my restaurant excursions to be special! I think this is partly because my parents didn’t have a whole lot of money when I was a young kid, so any time we went out to eat, it was a memorable and notable experience, so I still have a lingering (if diminished) sense that going out to eat should be special. Anyway, a few months ago I decided we should further cut down our eating out, preferably to only once or twice (or thrice) a month, and that we should plan it and not use it as a fallback for lunch when we’re out running weekend errands or something. So, a few weeks ago, I told S we should go out for brunch at Lazy Jane’s Cafe on a Sunday. We’d been there once before, and I was pleased with my meal and wanted to return to try something else. S loves brunch, so he was more than amenable to the idea. Last time, I ordered a seitan hash, which usually comes with eggs. I replaced the eggs with more hash and received a giant plate of savory, tasty seitan and a side of potatoes. Yummy and incredibly filling. 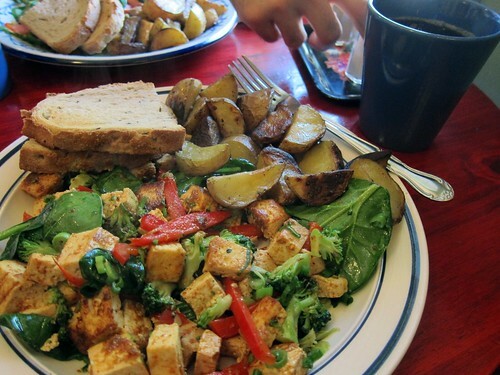 This time, we both ended up ordering the Curry Tofu Scramble, which comes with a huge side of potatoes and toast. S recently decided to take the vegan plunge <insert fist pump here>, and the scramble is actually the only menu item that’s totally vegan without modifications. It was a quality scramble. The curry flavor was just spicy enough, with a complex blend of spices and complementary crisp, fresh, perfectly cooked veggies. The potatoes and toast were equally yummy. Lazy Jane’s uses bread from a local bakery, and even though S unknowingly chose a non-vegan bread for his toast, one of the cooks noted his vegan scramble order and kindly toasted up one of the vegan bread options just in case and then asked him which one he wanted – score one for customer service! Despite its tastiness, I could barely eat a third of my scramble – we’d split a vegan Lemon Cream scone (!) while we waited for our meals, and between it and my delicious mug of coffee, my tummy was getting full when our order arrived. But it was totally worth it – the scone was a lemony dream, and I had scramble leftovers for lunch the next day. All in all, this visit to Lazy Jane’s was a worthy use of one of our restaurant meals for May. It’s a cute, cozy fast-casual restaurant, so there’s no tip required, which saves a bit of cash. It is, however, always crowded and there’s always a line to order, but I don’t mind – it gives you time to drool over the pastry case, which allegedly always contains one vegan baked good. I do wish there were a few more vegan meals on the menu, though – it’s one of those places that advertises itself as being vegan-friendly, but having only one (and a half) vegan options really just makes you sort of vegan-semi-friendly, y’know? How often do you go out to eat? What’s your favorite brunch food?